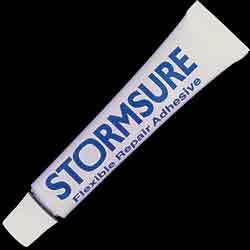 Best Seller for fixing wetsuits, waterproofs, waders and boots and shoes and inflatables.Use Stormsure Flexible Repair Adhesive for repairing items of virtually all flexible materials like Neoprene, Rubber, Leather, PVC, PU, Breathable materials and Coated fabrics. Fix split seams, loose soles, cracked leather, and leaks and rips in all types of footwear. Also ideal for repairing rips, splits, leaks and tears in wetsuits and dry suits, waders, waterproof clothing, ponchos, tents, marquees, ground sheets, awnings, paddling pools, pool liners, inflatable boats and toys, horse rugs, trainers, car seat repairs, children's toys etc. Works on most materials, but not Polythene, Polypropylene or PTFE. Also great for many woodwork repairs like chair legs etc.The only glue you need to fix a rip leak or tear on any flexible material or fabric. Very strong, but remains flexible when cured. Very resistant to abrasion. Essential in a repair kit for Hikers, fishermen divers, campers, caravaners, fishermen, wind, kite and board surfers, sailors, soldiers etc. Not Aqua seal or Aqua sure but does exactly the same job, but it does not form a skin as quickly which allows more working time.